1 Remove the halibut fillets from the refrigerator and allow to come to room temperature before cooking. Preheat the oven to 180°C/350°F/Gas 4. Heat the oil in a saucepan and fry the celery, garlic, onion and bacon for 2–3 minutes until the bacon is golden brown and lightly crisp, stirring frequently. Remove from the heat and tip in the haricot/navy beans, tarragon and lemon zest. 2 Season the halibut well with salt, then heat the coconut oil in an ovenproof frying pan until hot. Add the fish and cook for 2 minutes or until lightly golden. 3 Transfer the pan to the oven and cook for 5 minutes. After this time, remove from the oven, turn the fillets over and allow them to rest, off the heat, for 5 minutes – the residual heat from the pan should cook the fillets through. 4 Meanwhile, bring a saucepan of water to the boil and blanch the green beans for 2–3 minutes until al dente, then drain well. 5 Heat through the bean and bacon mixture. Add the yogurt to the pan and toss briefly to heat through. 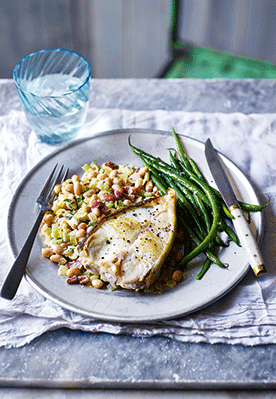 Serve the halibut with the bean mixture and the green beans alongside.